Rowing on a DP BodyTone 300 rowing machine works your legs and core while giving you a cardiovascular workout. A rowing machine provides little impact on your joints so you don't have to sacrifice possible joint strain for an effective workout, according to Men's Total Fitness' "Rowing Machine Buyer's Guide." 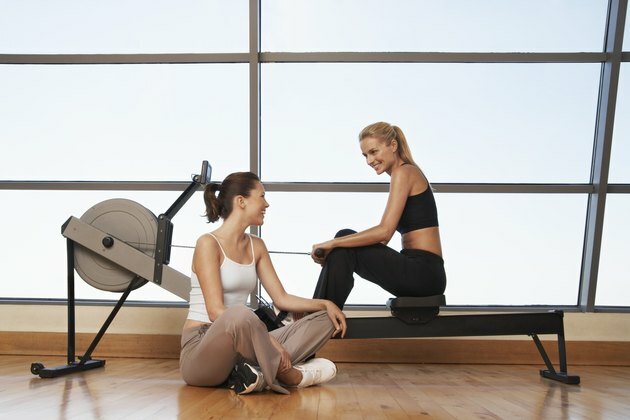 Exercising on a rowing machine may burn approximately 413 calories per hour even at a light intensity for a 130-lb. person, whereas a 190-lb. person may burn more than 1,000 calories with very vigorous effort, according to the Department of Health and Family Services. Sit on the DP BodyTone 300 and place your feet on the platforms. Reach forward and grab the bar, bending your knees but keeping your spine straight. Keep the arms straight too. This is called the catch. Press through your feet to nearly straighten your legs as you lean back, still with a straight back. Bend your elbows and pull the bar toward your sternum. Pushing with your legs will slide the seat of the rowing machine backwards. This is called the drive. Straighten your legs fully and pull your arms back so your elbows brush past your sides. Pull the bar to touch your stomach. This is the finish. Extend your arms straight in front of you again. Bring your torso forward slightly past perpendicular to the machine and slightly bend your knees. This is the recovery. Lean forward and bend your knees back to the starting position, or the catch. This completes one stroke. Continue rowing on the DP BodyTone 300 for as long as your workout goal. Work out as long as your cardiovascular sessions go. Workout time is unrelated to the particular machine you use. Use the rowing to do Tabata workouts for a greater cardio benefit. Sit on the rowing machine and grab the handles as described above. Place a clock with a second hand in front of you before you begin if there is not already one in sight. Row as quickly as you can for 20 seconds, but do not exceed your maximum heart rate. Your max heart rate is 220 beats per minute minus your age. Slow your rowing to a recovery speed for 10 seconds. Do not stop moving even if you are exhausted, but row at a slow tempo. Speed up again for 20 seconds. Go as fast as you can without going over your max heart rate. Use a heart monitor chest strap with watch display if you want to monitor your heart rate exactly. The DP BodyTone 300 does not have a heart rate feature on the machine. Decrease your speed for another 10 seconds to recover. Repeat the 20-10 cycle a total of eight times.